Snapchat did it again. After introducing Snapcash, just a few days ago, the social network revealed a new ad-format during the American Music Awards. Earlier in June, Snapchat had rolled Our Story, a collection of images aimed at giving people a glimpse of experience from live events. The content was 100% user generated, with members uploading their material on specific lists. 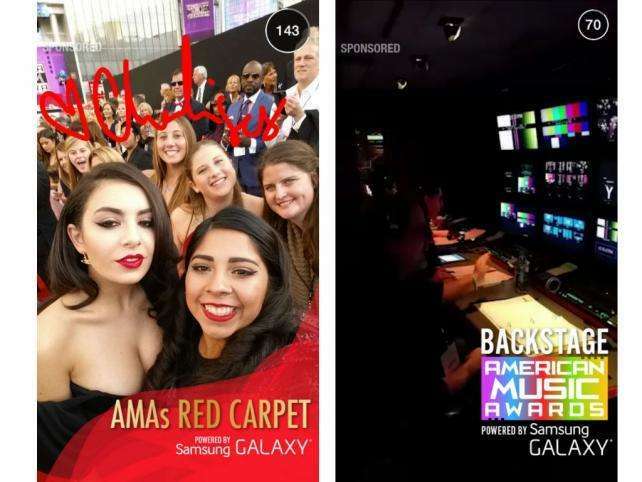 After its huge success, Snapchat sold this feature to Samsung for the American Music Awards. It’s the first time that Snapchat has done so and we’re sure that many more will follow. #Snapchat introduces Sponsored “Our Story” collections. Read the details. All images appeared with a “Sponsored” watermark, showing clips and shots from backstage, red carpet and the actual stage. This is the second ad-format that the social network lends to marketers. The first one was a 20-second clip of the upcoming film “Ouija”.